Invites you to an evening of fundraising…. Susie, (my 16 year old daughter who helps me on the Farmers Market stall) is going to Vietnam and Laos in July next year with ‘World Challenge’. They are going for a month and will be working in an orphanage whilst there. To show my support I am organising an evening of fundraising. Little Houndales Knits will open at 5pm for you to browse the yarns and pattern books at your leisure, eat cake, drink tea (or maybe a drizzle of wine! ), followed by the opportunity to watch a cookery demonstration from Pampered Chef and browse My Secret Kitchen and Forever Living Aloe Vera products. There will also be a 100 square lottery where you pay £2.00 for your square, when everyone has had opportunity to purchase a square, half the monies raised will go towards Susie’s Vietnam fund and the other half will go to the winner to spend on Pampered Chef. A percentage of all Pampered Chef sales will be added to Susie’s funds. A percentage of all My Secret Kitchen sales will be added to Susie’s funds. A percentage of all Forever Living sales will be added to Susie’s funds. And 10% of any Little Houndales Knits sales will be added to Susie’s funds. Susie has £3,500 to raise in total, so far she has raised over half of this but we’ve still a big chunk to go so let’s make this a great evening of fun and fundraising. Bring your friends and their friends, the more the merrier….and more funds for Susie! Doors open at 5pm Tuesday 15th October, Pampered Chef cookery demonstration will commence about 7.30pm (and you can taste the finished product later) and the evening will wind down around 10pm. Look forward to seeing you and thank you in advance for your support! Love at first sight! I just love this sweater, I don’t know if it’s the colour, the fluffiness, the pattern, the shape or what, but I can just see myself wearing it as my ‘favourite sweater’! In the ball the yarn reminds me of a baby sparrow, soft and fluffy and gorgeous muted greyish browns. The welt knitted up quickly and as I was excited to get on to the pattern it probably knitted up even quicker!! The pattern is a kind of sideways chevron worked by slipping stitches and passing the yarn across the slipped stitches on the right side. I thought as it’s only a 4 stitch pattern which basically travels to the right for 12 rows then to the left for 12 rows it would be a piece of cake….but it took a bit of getting into! I think you need to either follow the pattern intensely, be good at problem solving or good at working things out. 7 rows in, after the first decrease, I was somehow 1 stitch out and I couldn’t for the life of me work out what was wrong! I walked away, came back 10 minutes later and saw the problem straight away! I think I just had a dopey head on! I’m now 10 rows in and I have got the pattern in my head, I know exactly what I’m doing and I’m able to see straight away how it all works, it’s amazing how things all come together! I knew it wasn’t beyond me but I could quite easily see how this pattern would have some knitters scratching their heads. Now I have it worked out I thought it would be a good time to put the kettle on and write about it. I hope I haven’t put anyone off knitting it as it truly is gorgeous now I can see the pattern coming through and now I have it worked out, it is actually really easy! My best advice is to persevere, it’s not that you are not capable, it’s just a bit tricky to get going….10 rows in and you’ll be away!! 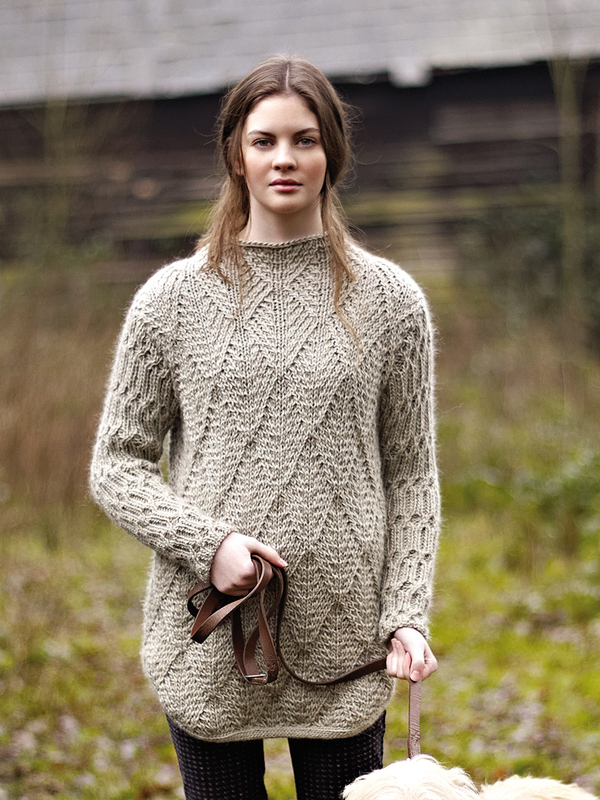 Rowan Yarns coming to Little Houndales Knits!!! I can’t believe I managed to take up ALL afternoon with the Rowan rep!….the poor woman!! There are just so many yarns, colours and patterns to choose from, the choices are endless, narrowing it down to the few I have room for has been a rather difficult task!! I have been tempted to dip into Rowan since we started in 2010 but never felt we were well enough placed in the big wide yarn world to take it on!….But this afternoon, after some careful planning and pondering, I have placed an order for several yarns and pattern books and plan to launch in about 6 weeks….so watch this space! We have on the list, Lima, Cocoon, Felted Tweed, Fine Tweed, Kid Classic, Alpaca Colour, Angora Haze, Magazines 52 and 54, and individual booklet support for the yarns I have chosen!! Both Alpaca Colour and Angora Haze are new yarns for Autumn Winter 2013/14 and we’ve taken the full colour palate of both yarns in addition to a good selection of shades from the other yarns. I found it very hard to resist and pondered for…hours! Saturday opening and new arrivals…. Click here to visit Little Houndales Knits online!